Buy this back issue! Available as a downloadable PDF. Among the many people I learned to laugh about at my mother’s knee were academics. My father was a history professor in University College, Dublin (UCD), and tales of allies and enemies were the stuff of conversation, argument and hilarity around the kitchen table. I was a toddler when I learned the names of two distinguished academics from Dublin’s other university—Trinity College: “Ruth, put that in Otway-Ruthven,” was the instruction to take dry rubbish to the bin in the scullery, for Professor Jocelyn Otway-Ruthven was a scholar so austere as to be dessicated; “Ruth, put that rubbish in McDowell,” was the instruction to take food waste to the bin under the sink that fed the compost heap. I can’t remember why Professor R.B. McDowell was given the accolade of being associated with wet rubbish: it may have had something to do with his being a bit of a hypochondriac. In his mid-nineties, now, and going strong, he has long outlived my parents. The strange habits of Professor Desmond Williams, my father’s closest colleague, were a cause of continual mirth. Desmond was as unreliable as he was brilliant: typically, he would miss several lectures but when he found time in his busy social life to turn up, he would stagger in on his stick, collapse into a chair, ask the nearest student what he was supposed to be talking about and deliver a stunning and fluent talk about the balance of power or the rise of Hitler or British foreign policy—lighting one cigarette off the other and scattering ash all over his crumpled food-and-wine-stained shirt and tie. He was an intellectual giant who made us all think: these days, of course, he would be unemployable. As indeed would my father, another inspirational teacher given to what would now be described as inappropriate behaviour. I was brought up with a ring-side seat at the performance that was Irish academic life in the 1950s and 1960s, where alcohol played a major part in ensuring that rows were often public and spectacular. I learned that grown men (there were very few women) could act like five-year-olds in their determination to keep their toys to themselves, and that chroniclers of the foolishness of the power-hungry could fight nigh unto death about which candidate should be awarded an assistant lecturership. I learned how much time could be wasted in pointless plotting and how useless most academics were at running anything. Then I married and went to Cambridge, which (along with Oxford) was in many ways familiar to me from great mystery writers like Dorothy L. Sayers and Michael Innes and Edmund Crispin, who gave me a taste for funny crime. My then husband had a Research Studentship at the notoriously conservative Peterhouse, where all departures from tradition were frowned upon. The dons’ feasts were not quite as gross as those featured in Tom Sharpe’s Porterhouse Blue (something along the lines of a swan stuffed with a goose stuffed with a duck stuffed with a capon stuffed with a thrush stuffed with a sparrow), but in their self-indulgence, they weren’t far off it. College servants were grave, women to be kept well away from college premises and it seemed that if every undergraduate had a prime minister’s baton in his inside pocket. In 1968, fashions changed and for a time students became for a time more focused on trying to bring down the Establishment. I was briefly at Girton, one of the then three all-female colleges, but I couldn’t stand the austerity, discomfort, propriety and high-mindedness and decamped to a modern mixed college too new to have any soul: I spent as little time there as possible. Men’s colleges were much more fun and I was fascinated at their often nonsensical conspiracies and feuds. The issues they fought over were often even more ridiculous than those that used to convulse UCD, for there the academic staff had homes to go to. In Cambridge, there were many single fellows who had lived in college premises for decades, had little grasp of reality and could start major wars about such trivial issues as whether to replace the curtains in the senior common room. I learned quickly that British scholars could be quite as—if not even more—infantile than their Irish equivalents. There were stories about distinguished old men who had hated each other for sixty years grimacing at each other from either end of high table and telling anyone who would listen that Smith or Jones had falsified a footnote in 1937. It was recognising the sheer narrowness of Cambridge life that made me revise my earlier ambitions to follow in my father’s and brother’s footsteps and become an academic. I abandoned medieval ecclesiastical history and headed for a wider world, but since some of my close friends had become dons, I always kept in touch with that world both in Britain and in Ireland. My fifth satirical mystery, Matricide at St Martha’s, which was published in 1994, was the Cambridge novel I had thought about occasionally over many years, made topical by the inclusion of a war over political correctness. As Jack Troutbeck, Mistress of St Martha’s, elbowed Robert Amiss out of the leading role in my mysteries, academia became a constant. Through lecture tours and mystery conventions and American friends I became increasingly interested in universities across the pond and began to read voraciously about the dumbing-down of US campuses and the triumphal march of the thought-police. Murdering Americans, which is based in Indiana, will be published in April. Whatever it is, it certainly is not politically correct. After being a Cambridge postgraduate, a teacher, a marketing executive and a civil servant, Ruth Dudley Edwards imprudently became a full-time writer. A journalist, broadcaster, historian and prize-winning biographer, her recent non-fiction includes books about The Economist, the Foreign Office, the Orange Order and Fleet Street. Targets of her satirical mysteries so far include the civil service, gentlemen’s clubs, academia, the House of Lords, the Church of England, publishing, the literati and, above all, political correctness. She has three times been short-listed for awards from the British Crime Writers’ Association. Her website is at ruthdudleyedwards.com. Not that Katherine Welsh’s wonderful article of the same title (MRJ, Fall 2005) isn’t complete as it is. But the phrase has so much richness, it deserves another look. To declare of an argument or a topic “it’s academic” is to relegate it to a classroom or to a textbook, proclaiming it moot, with no value for the real world. Mysteries, on the other hand, are all about the real world. Mystery readers look for solutions, clear motives, and simple justice. Writers are asked to produce “realistic” characters and “believable” plots. We read furiously to reach the end, enjoying the ride, yes, but hungry for the “answers.” Who did the deed? Why? How will the protagonist figure it out? What will be the “aha” moment? Will the killer be brought to justice? How did the protagonist change as a result of the events of the story? A history professor I know, on the East Coast, found himself on the review panel for a doctoral thesis on a problem in the history of quantum mechanics. He emailed me in a panic. He was the only nonscientist on the committee. He needed to look as smart as the rest of them. He attached the student’s ten-page summary and asked if I could come up with two or three intelligent questions for him to pose to the student who was defending his thesis. “I can do that,” I said, always thrilled when someone wants to learn science, for whatever reason. I called him the next morning, with three questions that I was ready to discuss. So, is it oxymoron-ish to have mysteries set in academia? Hardly—I’m convinced that it’s this disparity between the ivory towers of academia and the nitty-gritty world of mysteries (even cozy mysteries) that makes “academic mysteries” so appealing. Indeed, there’s nothing like a good, juicy crime in the lofty towers of academia. The higher they are, the lower they fall. One of my favorite recent reads, Gentlemen and Players, by Joanne Harris, takes full advantage of the contrast. The setting: an English school for privileged boys, where a lost pen or a misplaced mug with the school logo can upset an entire faculty. Within this framework are all the dark elements of a crime novel and a “villain” who believes that murder is simply an arbitrary line in the dirt, no more daunting than the “No Trespassing” sign at the edge of the school property. Thomas H. Cook’s The Chatham School Affair, a classic in my mind, is another example—a story of madness and murder at a small, orderly, private school in a Cape Cod village. Though I haven’t (yet) written an academic mystery, I do feel qualified to write about academia: I’ve spent most of my life in school, on one side of the desk or the other, and still teach at several educational institutions, in person and on line. In fact, my sister and I both overdid school at bit, possibly trying to compensate for the generation before us. Our parents had only about seven years of formal schooling between them—less than one for my father, six and a half for my mother. My sister and I have had forty-six years of school between us, twenty-three each, resulting in two BAs, one RN, one CRNA, one MS, one PhD and one JD. This means that if I do ever write an academic mystery, I have a long list of potential victims handy: my high school history teacher, who was first and foremost the football coach, thus ruining any chance I had of appreciating the past; the intolerant shrew who ran the “academics” program at an East Coast women’s prison where I taught; the principal of an elementary school on the West Coast who told an assembly of children that the most important thing they could learn was to put things back where they found them; and—getting back to Ph.D. committees—the priest-professor who angrily railed questions at me without waiting for “answers,” and ran off the next day with the Dean of Women. 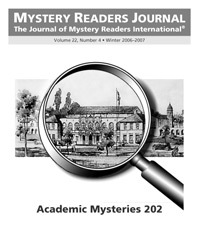 When I do write that academic mystery, you’ll know who did it. Camille Minichino is the author of eight books in the periodic table mystery series. She’s on the faculty of Golden Gate University in San Francisco and is NorCal President of Sisters in Crime.